The purpose of SwordSearcher is to improve and aid Bible study. No feature is added to SwordSearcher unless it aids in reaching that goal. Every element in SwordSearcher's user interface exists to make it easier or faster to get information you need during study, whether it be devotional or in-depth research. What follows is a general explanation of various design elements of SwordSearcher Bible software. For more details on these features, see Features and Screenshots. You can also watch a video overview of SwordSearcher. SwordSearcher has four primary "study panels" that are usually viewed simultaneously. This is the primary location where Scripture is viewed. When you do a Bible search, every verse from your search is loaded here, so that you can read the full text of each verse, and if necessary, click it to read the context of it in the Bible Display. Other search results are also displayed here; for example, you can search all of the commentaries for a word or phrase and see previews from the matching entries here. This panel contains "books," which are typically Bible dictionaries or encyclopedias accessed topically. This panel shows commentary text, such as an entry from the Jamieson-Fausset-Brown commentary, or cross-references from the Treasury of Scripture Knowledge. SwordSearcher's "four study panel" design concept divides the SwordSearcher window into the four common types of study resources. 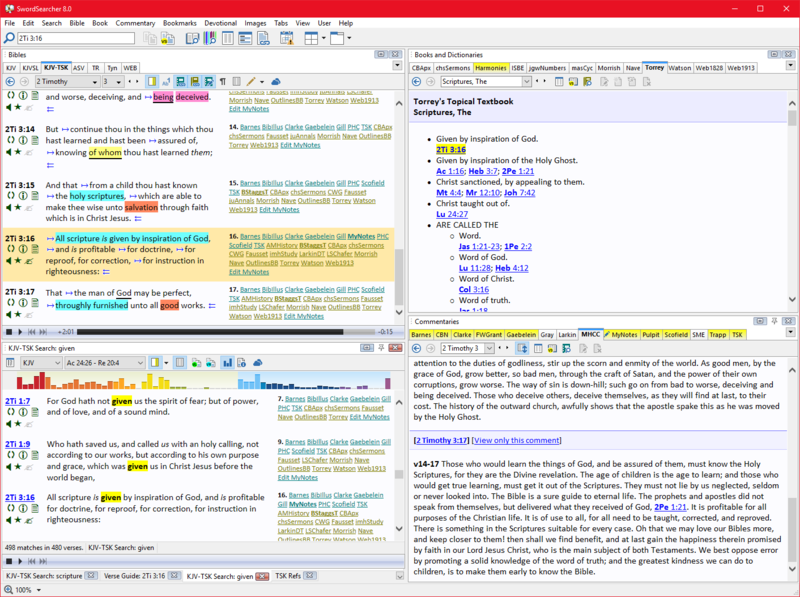 Because they share the SwordSearcher window, they do not overlap each other, so it is easy to read a commentary on a verse or check a dictionary without having to shuffle around windows. Also, any display can be switched off when it is not needed. Finally, advanced users can completely customize the panel layout to suit their own preferences, including cloning panels or spreading the various panels over multiple monitors. All of the commentaries and dictionaries in the world are nearly useless if you can't efficiently access the material in them. 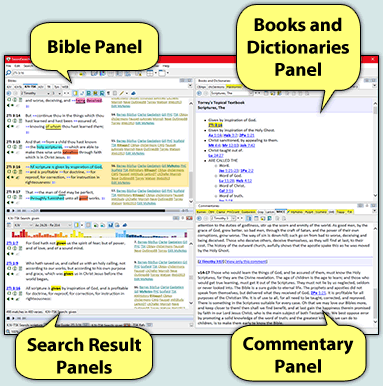 The Bible Panel has "margin links," linking verses to all of the relevant library material available. 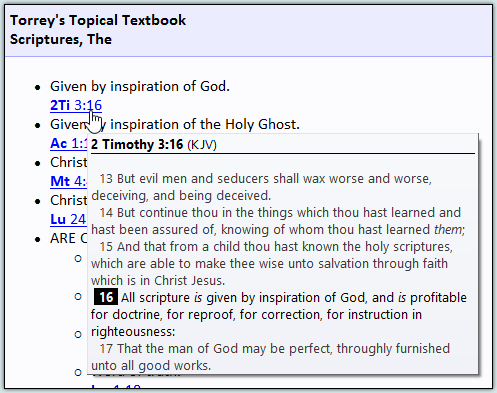 In this example, Ephesians 6:17 is displayed, and to the right of the verse, links to commentaries and books for that verse appear. 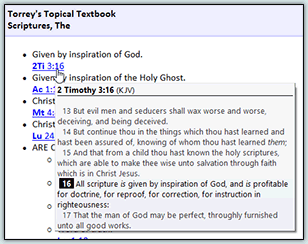 Clicking on "CBN" would immediately open the Companion Bible Notes commentary entry for Ephesians 6:17 in the Commentary Display, without moving the Bible display from the verse. Clicking "Easton" would present a menu of dictionary headings from Easton's Bible Dictionary that reference Ephesians 6:17. In SwordSearcher, it is not necessary to hunt through menus to study library material. As a result, your study time is more productive. And because SwordSearcher is easily customized, you can turn off links to material you are uninterested in, or disable the margin links completely when they are not needed. When reading a commentary or dictionary in printed form, it is often a time-consuming task to look up Scripture references from the text. 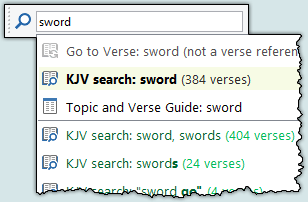 But when reading a commentary or dictionary in SwordSearcher, examining Scripture references is as easy as moving the mouse over a link, and the text of the verse will pop up into view. Further, to examine the context of a referenced verse, you only need to click a link to have its entire chapter shown in the Bible panel. You want to study the Bible. SwordSearcher makes getting to Scripture fast and simple. Anyone who has made extensive use of a concordance during Bible study knows how cumbersome they are when you are trying to find Bible verses. But not with SwordSearcher. Finding all of the verses in the Bible with, for example, the words "sword" and "spirit" is simple. Just type in the word into the Search toolbar and hit enter. The verses are loaded instantly into a Verse List panel. You can do more, of course, such as limiting your search to a particular book or Testament, or search for an exact phrase instead of a collection of words, find word forms or "close" matches, or even use advanced boolean expressions if you need to. You can even examine a complete list of all of the words in the Bible to help you find out what you are trying to search for. 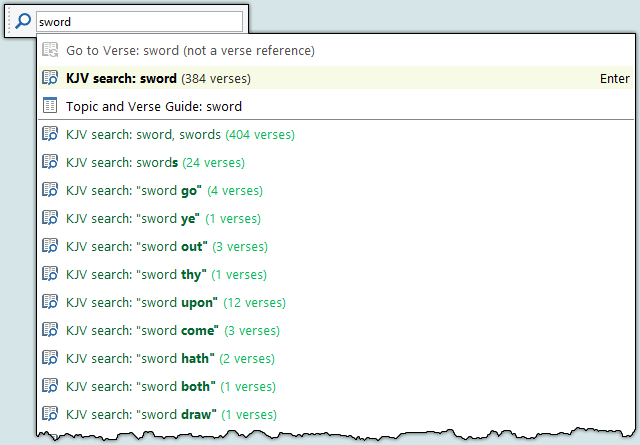 And, when you need to search everything, including commentaries and dictionaries, you can do that too, with SwordSearcher's Full Library Search. A recurring theme in the design of SwordSearcher is easy access. It is easy to get there from here. Holding your mouse over a Strong's link in the KJV with Strong's Links will show you the Strong's definition in a popup display -- no need to click it unless you want to open it in the Book panel. Do you want to search for the Strong's number in the Bible? Just right-click the Strong's link and select the appropriate search option from the menu. Holding your mouse over a verse will show the verse -- no need to click it unless you want to move the Bible panel to the verse. Or, if you're reading a book or commentary and you want to read all of the referenced verses at one time, you can do that too. Just right-click the display and select "Load all referenced verses" and a Verse List panel will show them. Do you want to copy the verse you see to the clipboard? There is no need to mark it with your mouse, just right-click the verse and select "Copy this verse." Want to print exactly what you see in one of the panels? Just right-click it and select "Print this window." And with SwordSearcher, there is no need to traverse convoluted "trees" of library material to open the resource you want to see. Every book, dictionary, commentary, and Bible has a tab right on the screen. Are there tabs you never use and don't care to see? No problem, you can hide any of them, and still access the material on the menus if you need to, or bring all the tabs back with a mouse click. Do your eyes get sore after a long session on the computer? SwordSearcher will gladly increase the font size of all of the displays automatically for you with a simple keypress, and reduce them with another. No need to go to a configuration dialog for that, unless you want to. SwordSearcher is designed for believing Bible study, for people who hunger for information and want to use their computer to expand their knowledge of God's holy word. SwordSearcher is not loaded with fancy, frilly extras that look good on advertising copy but do nothing for your study time. Please give SwordSearcher a try. It is an honor to write software that you can use to improve your Bible study. More details on these features and others not explained here can be found on the Features & Screenshots page. Buy your Deluxe Edition DVD (or download) now with a 30-day money-back guarantee. Only $59.95. Or, download a free trial edition now with a limited set of library resources to see how SwordSearcher will improve your Bible study.